“Everton has agreed an undisclosed fee with Manchester City for the transfer of defender Joleon Lescott. The Club had previously rejected two offers for the England centre back, with David Moyes repeatedly stating his desire to keep his best players at Goodison Park. However, Lescott informed the Club he wanted to leave 12 days ago, submitting a formal transfer request. That request was quickly rejected, with the Blues boss again reiterating he was unwilling to sell the player. But since then Moyes has revealed there was a noticeable change in the player’s attitude and as a result decided that it is in the best interests of the Club if he allowed Lescott to leave. Chairman Bill Kenwright has worked tirelessly to get the best deal for Everton, achieving a substantial increase on Manchester City’s initial offer. No surprise really. In fact, there has been a sad inevitability about Lescott’s departure from Goodison Park. “We shouldn’t have been asked to wait this length of time for an amount of cash we think was the correct value for the player. “Real Madrid came in with the money (£80million for Cristiano Ronaldo) for Manchester United the week after the end of the season. “If the money had been offered in June it would have been a lot easier for us. Well, Everton wouldn’t have been asked to wait if they’d have accepted Man City’s initial bid, but it’s only right that they tried to extract as much cash as possible from City. And reports claim that City will give up around £24m for Lescott. That’s at least £6m too much – this is Joleon Lescott we’re talking about, not Franz Beckenbauer or Franco Baresi. Conversely, it’s all rosy at Eastlands, where Mark Hughes has assembled a squad that is very well-equipped to compete against the big four. How much easier it is to do business when you can add as many zeros as it takes to lure good players away from clubs where they are prized. Bottom line: without the money, Lescott would still be at Everton. Some people are saying that Hughes has bullied Everton into selling Lescott, but that’s unfair. I think Hughes is a decent guy and in using his club’s funds to buy the players he wants, he’s only doing what any other manager would. I think the toughest pill for Evertonians to swallow is that only last season, they were above City in the pecking order. This must be terribly galling. 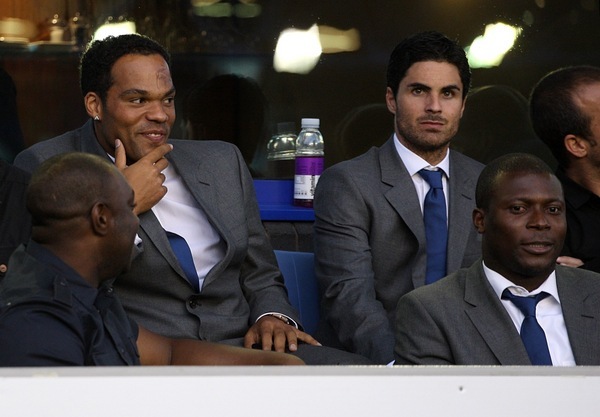 Arteta looks like he’s shat himself but he doesn’t want to move, disturbing the smell. Although Yakubu looks like he’s straight onto it. Lescott just looks like a man who’s about to come into an absurd amount of money. The shithouse. And that’s coming from a Kopite. They need to replace him.